The other day we noticed this crazy new docking station round the corner from Sell Towers on Shoreditch High St. 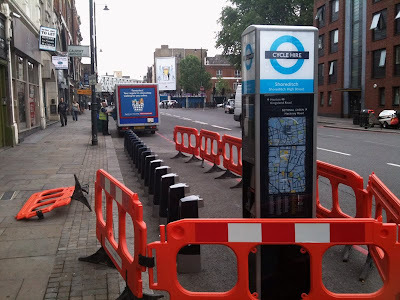 It's part of the wider London Cycle Superhighway thingy, you might've noticed blue lanes popping up all over the capital. It looks like everything is running smoothly and you'll be able to start hiring bikes from the end of July. You can find out more over yonder.